Another way to make the simulation a bit more realistic is to produce some sound when balls hit each other and when they hit the side of the table. The volume is adjusted to decrease as the collision speed decreases, with 100% volume corresponding to some (rather arbitrary) maximum speed. I did not investigate the actual physics – I suspect that the sound volume does not simply decrease linearly with the speed, but it sounds good enough. The audio files are loaded asynchronously by the browser, so in theory they should be played only after receiving a notification that loading completed (see here for example), but being very small file this is not really necessary. I recorded myself the two different sounds used for ball-ball and ball-side collisions – hitting two different surfaces with a pen, not very realistic but good enough for now (probably the title of this post should be ‘good enough’). I used Audacity to record the sound and cut them – I didn’t do any other editing. There are libraries of sound effects that can be bought quite cheaply, including billiard sound – see this for example, but they appear to be more complex sounds, not suitable for just a single impact. The code above contained a bug in the computation of the relative speed for ball-ball collisions, now fixed. ...activist investors seeking to crack Japan have fared only slightly better than the Christian missionaries of the 16th century (who were crucified). 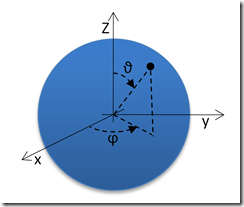 The simulation is two-dimensional: the table and balls are seen from straight above. Drawing the balls as simple circles produces a very un-realistic effect though; to improve things it is necessary to render in some way the rotation of the balls. The easiest way to do this is to add some feature to a ball surface – like a white circle – and change its position and size as the ball rotates. Note how the code uses gradients to fill the ball and the white circle to give a more ‘tridimensional’ look. The resource that is in shortest supply is usually time, since there is no way to create more of it. John le Carré in ‘Tinker, Tailor, Soldier, Spy'. 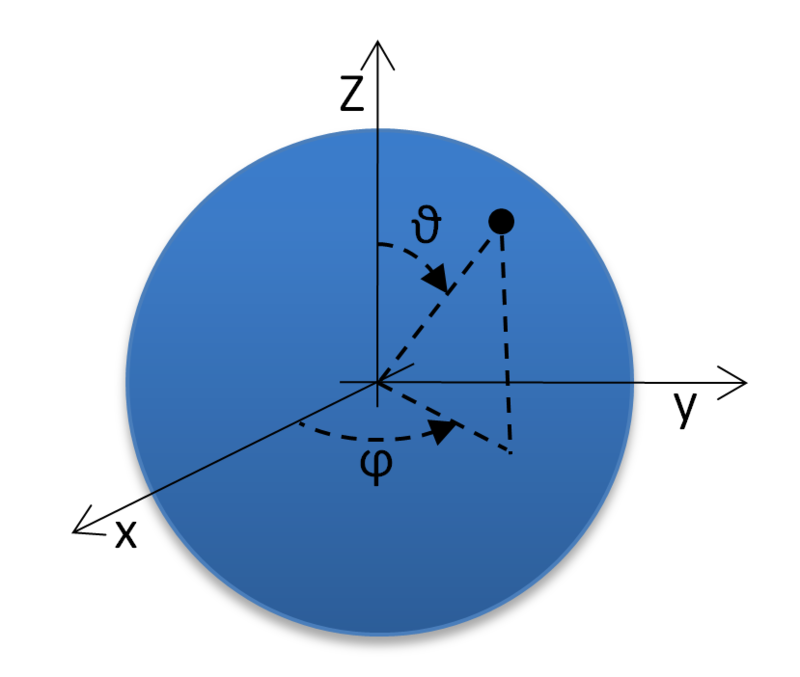 The velocity of the balls progressively decreases due to three different effects: loss of energy during collisions, friction with the table (rolling friction or rolling resistance) and friction with the air (drag). The loss of energy during collisions is already accounted for by the coefficient of restitution used in the collisions formulas. 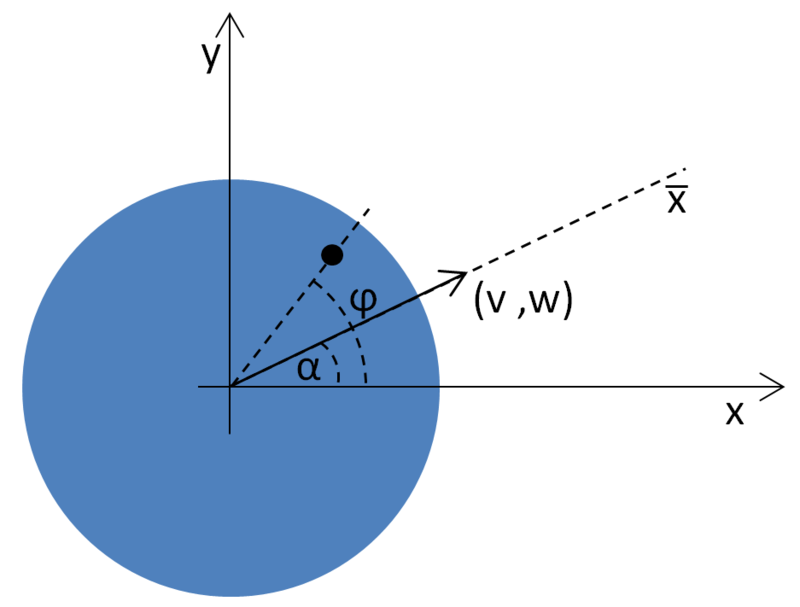 The drag coefficient \(c_d\) for a sphere varies quite a bit with the velocity of the object – see here for example, but overall the air drag is quite small, so even using a constant would not change the result much; hence given the air density and the ball density \(f_d\) can be considered a constant as well. where ‘detectCollisions’ is a function that uses the code described previously to detect the first collision – or collisions – that occur within the specified interval. It returns an object containing the time of the collision and an array of the balls that collide. Each element of this array has two members ‘b1’ and ‘b2’ containing the colliding balls (‘b2’ is null for collisions with the sides) plus a ‘type’ member that indicates if the collision is with the left or right sides (“x”), with the top or bottom sides (“y”) or between two balls (“b”). As promised in the title this code has a problem though: it works fine in most cases but fails when there are multiple ball-ball collisions at the same time. 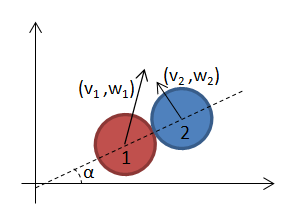 Have a look at this: the ball coming from the left hits the two balls at rest at the same time, but the code evaluates the collisions one at a time: it first consider the collisions with the ball at the top, updating the velocity of the moving ball to move down, and then uses this velocity to compute the second collision. The result is clearly wrong: the moving ball should bounce straight back, and the result should not depend on the order of the balls. I have no solution for this at the moment being. 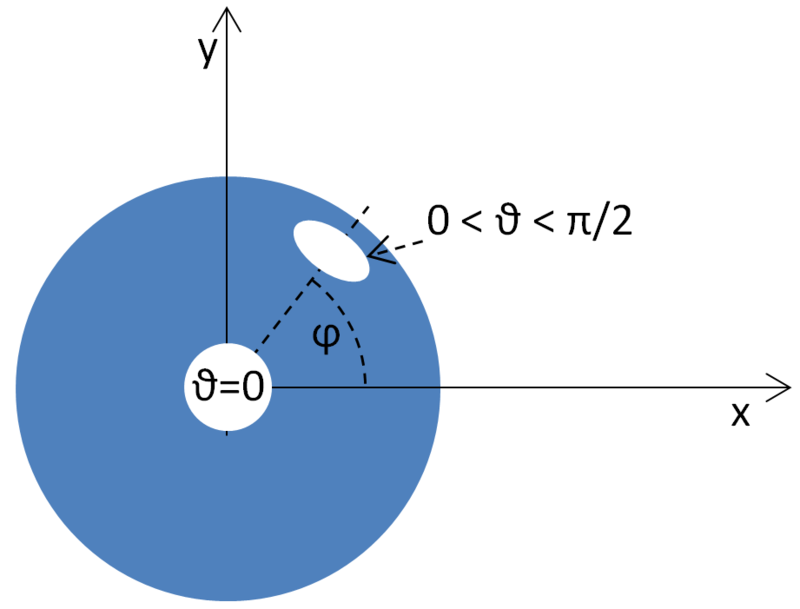 ..or more formally: elastic collision of spheres in two dimensions. that is the result for this simple case: the velocities after the collision in terms of the (known) velocities before the collision. 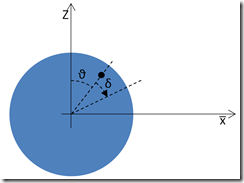 What abut the general case in which both balls move and are not aligned? where \((x_1, y_1)\) and \((x_2, y_2)\) are the positions of the two balls. A nice symmetric solution – and correct to boot. Assuming that all the balls have the same density, their mass is a fixed constant times their radius cubed. In the formulas above the masses appear always as a quotient, so they can be replaced with the balls’ cubed radiuses. 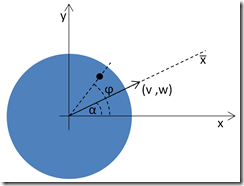 * The coordinate of the balls must be at the collision point. (*) That ‘naïve’ formula for \(\alpha\) does not work when \(x_1-x_2\) is zero, nor it handles the various possible combination of signs of the numerator and denominator, but in the code all that is handled by Math.atan2().